Originally from Calabria, Italy. Circulated through the Italian-Canadian seed saving community in Toronto before getting into my hands. 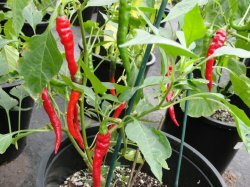 Heavy yields of finger width thin-walled red peppers up to 12" long. Great for fresh eating or drying. 85 days from transplant. HOT.